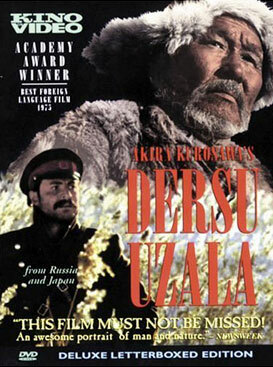 Legendary Japanese director Akira Kurosawa embarked on a film adaptation of the popular turn-of-the-century Russian book Dersu Uzala when he was just starting out on his illustrious career but quickly realised that it needed to be shot where it was set, in the remote regions of Siberia. It wasn’t until 1974, after a severe bout of depression which resulted in a suicide attempt, that the maestro returned to the project and fulfilled his original vision in a 70mm, two hour twenty minute epic about an intimate friendship in an infinite landscape. One shot in particular encapsulates this quality; it’s of the Russian army officer Arseniev (Yuri Solomin) and the eponymous Goldi hunter (Maksim Munzuk) watching the sun set and the moon rise with their trusty theodolite silhouetted beside them. Here the two men from vastly different backgrounds are united as kindred spirits in the swirling galaxy. But back in town, it’s a different matter. When Dersu’s eyesight fades he is taken in by Arseniev. However, he soon feels trapped within the four walls of his friend’s house and yearns for the mountains once more. The skills that enabled him and Arseniev to survive a raging blizzard on the frozen marshes all those years ago may no longer be as sharp as they once were but Dersu cannot be denied his wanderings. You can take the hunter out of the wilderness but you can’t take the wilderness out of the hunter. You can also take the entire spirit out of a foreign language film with a bad English dub. So whatever you do, select the original Russian option with sub-titles. And check out the extras interview with Solomin who gives some rare insights into working with Kurosawa and the legacy of the explorer Vladamir Arseniev on whose journals the film is based.